While the inclusion of a Mercedes in Mario Kart 8 certainly looked, uh, different, the ideal of cross-promoting Mercedes-Benz via Super Mario Maker is just downright weird. But, hey, here we go. 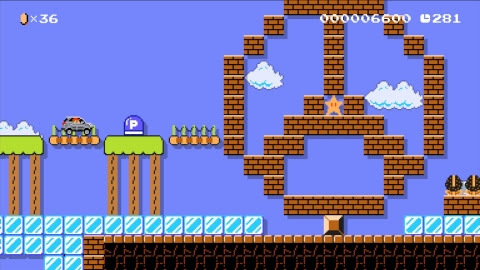 Available for a free download in the “Event Courses” section of Super Mario Maker is a new course with a Mercedes-Benz theme, featuring an unlockable Mercedes-Benz GLA costume with Mario behind the wheel. Check out the full press release from Nintendo below. REDMOND, Wash.–(BUSINESS WIRE)– Mercedes-Benz has created an original Super Mario Maker Event Course that will be delivered with a special costume for players to unlock at no additional charge. The course, called Mercedes-Benz Jump’n’Drive, arrives today and includes an unlockable Mercedes-Benz GLA costume that shows Mario in the driver’s seat. Once players unlock it by completing the level, they can add it to their collection of Mystery Mushroom costumes. This special content marks the second time that Mercedes-Benz has made fun additions to a Nintendo game: The GLA is one of multiple free downloadable vehicles in Mario Kart 8. The new Super Mario Maker Event Course was created by Mario fans at Mercedes-Benz who were inspired by the GLA’s appearance in Mario Kart 8and wanted to build a level with Mario taking the GLA on a road trip. The Mercedes-Benz Event Course takes players through a variety of automotive-related areas, including being at the dealership, taking a test drive through a city and eventually cruising down the autobahn. And as with any good Mario level, some surprises wait to be discovered. The Super Mario Maker game lets players create, play and share their own Mario courses using a wide array of enemies, objects and power-ups. Millions of courses have been uploaded for people to play, many using elements of the Mushroom Kingdom in ways never before encountered. Nintendo also has previously added a course designed by Facebook, the course featured in the final round of the 2015 PAX Prime Omegathon and other courses designed by Nintendo. The Mercedes-Benz Jump’n’Drive level is available in the “Event Courses” section of Super Mario Maker, which showcases special levels presented by Nintendo and partners. The level from Mercedes-Benz, the game’s exclusive automotive partner, can be downloaded for free by everyone who owns the game.